MC: Approximately 220 yards / 201 meters dk weight yarn. CC: Approximately 170 yards / 155 meters dk weight yarn. 24 sts per 4 inch/10 cm, 28 rows per 4 inch/10 cm, stockinette. A warm, oversized, easy-to-knit lace cowl that's great for color scraps! This pattern is knit flat and sewn together when you're finished. The pattern doesn't call for a provisional cast on, but if you prefer to use seam together live edges, you could use a provisional cast on without impacting the overall appearance of the cowl. As written, all right leaning lace repeats are worked with MC, and all left leaning are worked with CC. This cowl is really tall: tall enough that you can wear it around your neck and over your head at once (see photos). The finished cowl is really tall (this is awesome). But! If this isn't your cup of tea, adjust the number of stitches CO to any multiple of 8 and you'll be on your merry way. You could also make it larger if you want. This is a standard, single-wrap cowl. 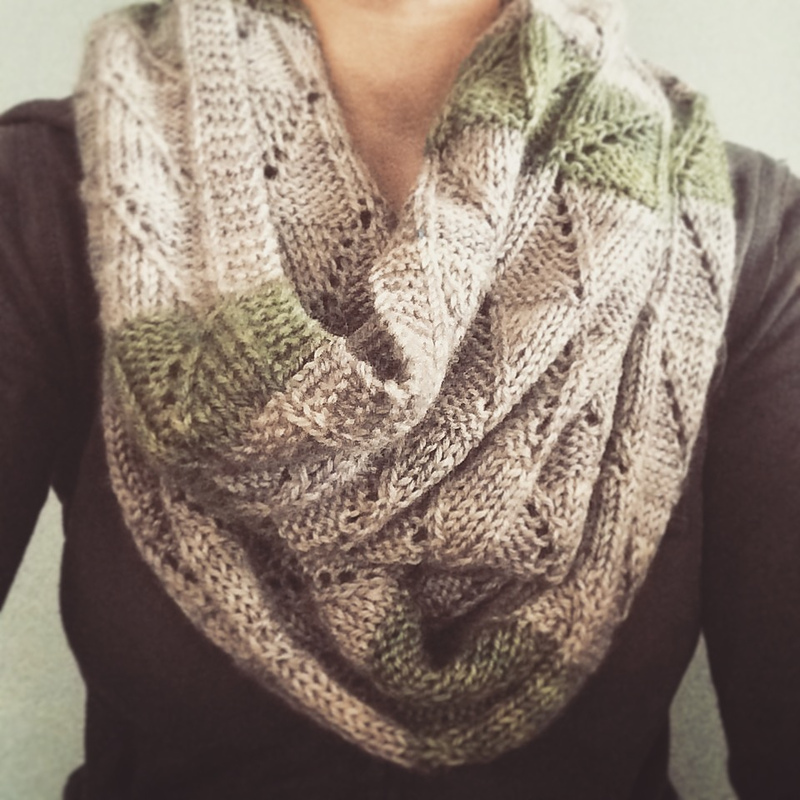 To make a cowl that wraps twice (or even three times! ), grab a ton of yarn and just keep knitting until you've reached the desired size. Alternate the colors and patterns whenever you feel motivated. Because this is so simple, it can be knit in any yarn weight you like. Just remember to adjust the CO multiple by 8 and have plenty of yarn handy. Using MC, CO 97 sts. Using MC, work 3 repeats of Right Lace motif. Using CC, work 1 repeats of Left Lace motif. Using MC, work 3 repeat of Right Lace motif. Using MC, work 4 repeat of Right Lace motif. Using CC, work 3 repeats of Left Lace motif. k4, *k6, k2tog, yo, repeat from * to last 5 sts, k5. k4, p1, *k1, p7, repeat from * to last 4 sts, k4. k4, *k5, k2tog, yo, p1, repeat from * to last 5 sts, k5. k4, p1, *k2, p6, repeat from * to end. k4, *k4, k2tog, yo, p2, repeat from * to last 5 sts, k5. k4, p1, *k3, p5, repeat from * to end. k4, *k3, k2tog, yo, p3, repeat from * to last 5 sts, k5. k4, p1, *k4, p4, repeat from * to end. k4, *k2, k2tog, yo, p4, repeat from * to last 5 sts, k5. k4, p1, *k5, p3, repeat from * to end. k4, *k1, k2tog, yo, p5, repeat from * to last 5 sts, k5. k4, p1, *k6, p2, repeat from * to end. k4, *k2tog, yo, p6, repeat from * to last 5 sts, k5. k4, p1, *k7, p1, repeat from * to end. k5, *yo, ssk, k6, repeat from * to last 4 sts, k4. k4, *p7, k1, repeat from * to last 5 sts, p1, k4. k5, *p1, yo, ssk, k5, repeat from * to last 4 sts, k4. k4, *p6, k2, repeat from * to last 5 sts, p1, k4. k5, *p2, yo, ssk, k4, repeat from * to last 4 sts, k4. k4, *p5, k3, repeat from * to last 5 sts, p1, k4. k5, *p3, yo, ssk, k3, repeat from * to last 4 sts, k4. k4, *p4, k4, repeat from * to last 5 sts, p1, k4. k5, *p4, yo, ssk, k2, repeat from * to last 4 sts, k4. k4, *p3, k5, repeat from * to last 5 sts, p1, k4. k5, *p5, yo, ssk, k1, repeat from * to last 4 sts, k4. k4, *p2, k6, repeat from * to last 5 sts, p1, k4. k5, *p6, yo, ssk, repeat from * to last 4 sts, k4. k4, *p1, k7, repeat from * to last st, p1. BO all sts. Using mattress stitch, sew the CO and BO edge together. Block and wear with love.